In. 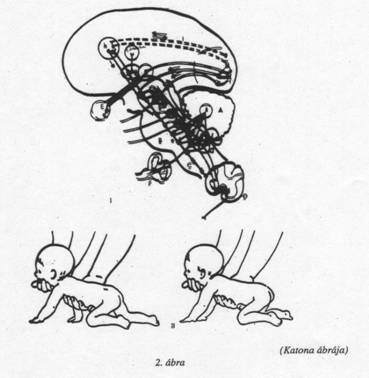 : Developmental Pedagogy (Fejlesztő Pedagógia), Budapest, 1994/4-5. The "Basic Therapy" Foundation’s method is the complex development of the nervous system, guided by motion patterns in succession of movement models. By using this form of therapy, minimal brain injury, attention deficit and hyperactivity disorder (ADHD, HAHAS or POS), mental retardation and developmental dyslexia can be influenced and sometimes even totally corrected. Our therapy is based on programs first developed by the neurologist Carl Henry Delacato, the neurosurgeon Temple Fay, as well as the physical therapist Glenn Doman. But even though these scientists have been at the origin of the therapy, we have been completing and wholly transforming the program into the "Basic Therapy", by using the basic studies and combining them with the therapeutically results and findings of the last years. The "Basic Therapy" supported by our foundation today is mainly influencing the brain of the child in the area where the problem has been located previously. We therefore based our method on the fact that every child is born with approx. 12 thousand million brain cells and will use only 10 percent of these during lifetime. Thus, our aim is to activate the so-called "dormant" cells and to lead them to take over the function of the damaged or immature cells. This progression in taking over can be easily followed by the watch of the movement development which continues until the pathway is fully matured, utilising all levels of the brain. The result is that the child i.e. can read fluently, can move as she/he can and well enough to take its place in society alongside with other children who are fully accepted in the world as a "normal" child or person. Due to the ever continuing gathering of results and the comparison with other findings during the process of individual therapy, we are constantly developing the forms and tools of "Basic Therapy". Our foundation helps to organise the constant exchange between the children under therapy and their parents on the one hand, as well as with the scientists following the projects on the other hand. We therefore finance the consultancy to parents as well as the education and training of scientists in the method of "Basic Therapy". In the future, we intend to create a centre of exchange and therapy in Budapest in order to popularise "Basic Therapy" and to open it to those who did not know a solution to their child’s problem until today. In order to succeed in this matter, we would need financial and moral support. The children and their parents would be most grateful if anyone could help. In case of any question we would be very happy to provide you with further information. Budapest, Harrer P. u. 10. Translated by Gabor Toth, M.Ed. 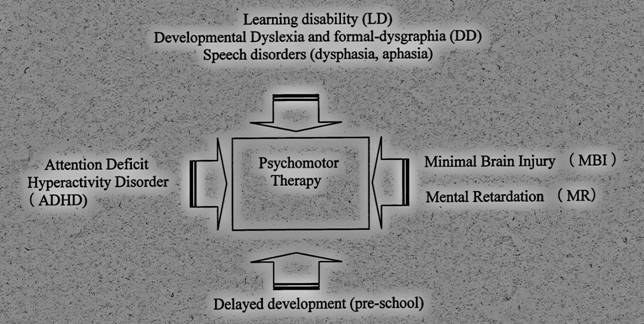 This paper was written as a Training Guide of postgraduate studies for special teachers, psychologists, ST and PT (mainly connected to dyslalia, dysphasia, dyslexia and LD). The aim of this paper　is "how we can use the scientific results of the neuro-psychology in the special education". The "Basic Therapy" Foundation (Hungary) is a group of different professionals (neurologist, psychiatrist, ophthalmologist, psychologist, ST, PT, Pető-conductor, special school teacher etc.) who want to make a complex developmental therapy, what's may effect the nervous system by making new and stable synapses-net (pathway) across the development of the movement co-ordination-system. This method is a Psychomotor Therapy dominated by sensorimotor development, guided by motion patterns in succession of the human movement models. By using this form of a developmental therapy minimal brain injury (MBI), attention deficit and hyperactivity disorder (ADHD), mental retardation (MR) and developmental dyslexia/dysgraphia (DD) could be influenced and sometimes even totally corrected. Our therapy is based on a program what was first developed by a neurologist C.H. Delacato, a neurosurgeonTemple Fay and a physical therapist Glenn Doman at the Philadelphia Rehabilitation Centre in the 60's. But even thought these scientists have been at the origin of the therapy, our Foundation have been completing and wholly transforming the program into the present Psychomotor Therapy, by using the basic studies and combining them with the therapeutically results and findings of the last years. We based our method on the fact that every child is born with approximately 12 thousand million brain cells and will use only 10% of these during lifetime. Thus, our aim is to activate the so-called "dormant-cells" and to lead them to take over the function of the damaged or immature cells. This progression in taking over can be easily followed by the observation of the movement development, which continues until the pathway is fully matured, utilising all levels of the brain. The result is that the child i.e. can read fluently, can move as s/he can and well enough to take its place in society alongside with other children, which are fully accepted in the word as a "normal" child. Due to the ever-continuing gathering of result and the comparison with other findings during the process of individual therapy, we are constantly developing the forms and tools of this method. Disorders of language development, what will effect the learning ability? 1. General language disability from genetic factors with a familial (inherited) pattern chiefly from the paternal side, and acquired language disorders due to damage sustained before, during or shortly after birth (i.e. perinatally). These latter perinatal damages encompass the gamut of toxic, infectious, traumatic, nutritional, hormonal and other damages that may hurt the growing foetus or young infant. - familial tendency to exhibit slow language development, lesser endowment in the brain area for language, inferior function in the highest brain areas of auditory performance without organic damage to the ears, slow maturation of motor function (including clumsiness and deviation from normal cerebral dominance), and other signs of delayed cerebral growth. Additional environmental causes include poor language patterns used by the family, parental neglect, emotional maladjustment, general weakness from prolonged disease, as well as various socio-economic, cultural and other psychological influences. While some otherwise perfectly normal children (particularly boys) may not elect to begin talking until age three, making good progress in every respect from then on. The absence of speech after age two may be caused by any of the conditions mentioned thus far and would appear to merit prompt investigation. If an organic cause can be detected, the symptomatic description of delayed language development then yields to a specific etiologic (causal) diagnosis. Although, it is best to describe the absence of speech in early childhood as simply delayed language development. Some American investigators tend to refer to this condition as congenital (present at birth) aphasia, a term rejected by most European scholars who argue that there cannot be an inborn or early acquired aphasia before a language has been learned (so called dysphasia). 1. The primary or developmental reading and writing disability due to constitutional (organic) and hereditary factors. 2. And a large secondary group of symptomatic reading disorders acquired through any of the influences that retard language development in general, including troubles with vision (that's why our team is working together with ophthalmologist and we consult in every case). Practically all investigators agree that primary or developmental dyslexia shows a marked hereditary tendency (is familial) and is typically associated with other disorders of psychomotor development, deviation from the prevalent right handedness and poor function in the auditory area in the brain, often associated with lack of musical talent. Primary dyslexia is significantly associated with other developmental speech disorders. 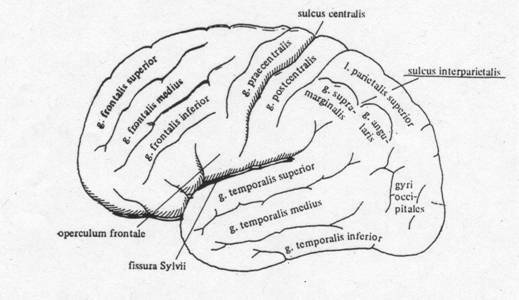 The language area of the brain surrounds the Sylvian fissure (see figure 1.) in the dominant hemisphere. This area is divided into two major components named after the pioneers Paul Broca and Carl Wernicke. 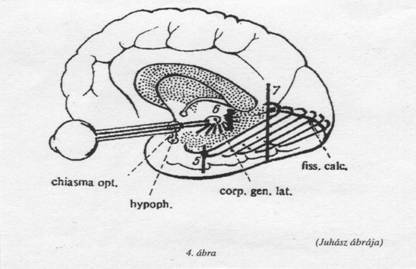 Broca's area lies in the third frontal convolution, just anterior to the face area of the motor cortex and just above the Sylvian fissure. This is often described as the motor, or expressive, speech area; damage to it results in Broca's aphasia what in the case of children called dysphasia. A language disorder characterised by deliberate, telegraphic speech with very simple grammatical structure though the speaker may be quite clear as to what he wishes to say and may communicate successfully. Wernicke's area is in the superior part of the posterior temporal lobe. It is close to the auditory cortex and is classically considered to be the receptive language, or language comprehension, centre. A child who has maturity problem or minimal brain damage in this area, or the patient with Wernicke's aphasia has difficulty understanding language. His own speech is typically fluent but is empty of content and characterised by circumlocutions, a high incidence of vague words like "thing," and sometimes neologisms and senseless "word salad." The entire posterior language area extends into the parietal lobe and is connected to Broca's area by a fibre tract called the arcuate fasciculus. Damage to this tract has been implicated in conduction aphasia (or dysphasia), a disorder in which the patient can understand and speak but has difficulty in repeating what is said to him. The suggestion is that, in this condition, language can be comprehended by the posterior zone and spoken by the anterior zone, but it can not be easily shuttled from one to the other. It is important to note that dysphasia and aphasia is a disorder of language and not of speech (although a dyspraxia/apraxia of speech, in which the programming of motor speech output is affected, may accompany dysphasia/aphasia). The writing and reading of dysphasic/aphasic child or adult patients, therefore, usually commits the same type of error as their speech, while the reverse is not the case. Isolated disorders of writing (dysgraphia) or more commonly, reading (dyslexia) may occur as well, but these reflect a disruption of the additional processing required for these activities over and above that required for language. One particular form of dyslexia deserves mention, as it is a clear example of a disconnection syndrome a disorder resulting from the disconnection of two areas (by the corpus callosum on Figure down) of the brain rather than from damage to a "centre." This is dyslexia without dysgraphia, or letter-by-letter reading, so called because it is not associated with writing disturbance and because the patients tend to attempt to read by spelling words out loud letter by letter. It usually results from a lesion in the posterior part of the left hemisphere that disconnects the visual areas (on Figure 2.) of the brain from the language areas. Also important the limbic system, what has important task in balance and attention. This renders the language areas effectively blind, so that they cannot be brought to bear on visible language such as the written word. Writing is unaffected because the right hand is still connected to the left hemisphere, and if letters can be spoken out loud correctly (which is not always the case), the child will be able to hear himself say them and reintegrate them into words. Disconnection syndromes are an important concept in understanding behavioural disorders (e.g. in the case of ADHD) associated with brain damage. The possibility that deficits are caused by disconnection must always be borne in mind. The first answer in our life is the motor-answer; our first communication is the motor-communication. 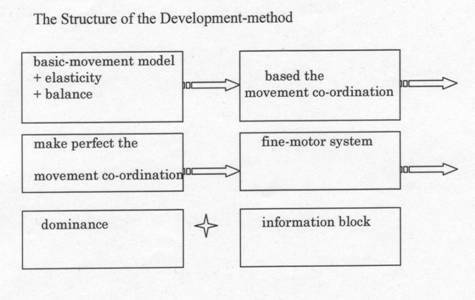 It means that our movement developmental process is the firs and fundamental communication with the close environment. Later all other communication-forms are based on this. Piaget's theory said that the first human measurable intelligence is the sensorimotor-intelligence and after from this developing all the next level. Motor skills are generally more easily remembered than are verbal skills. Researchers theorise that this greater retention is due to the fact that motor skills are more likely to be over-learned (repeated more often) than are verbal skills. The factor that most influences motor ability is chronological age. Subjects generally grow more proficient from the age of 4-5 until the end of 16-20's (individually differences), when their abilities plateau for a few years and then slowly decline. That is the reason why we usually start a therapy at age of 4 or mostly 5 and the oldest child is around 16-17 years old. The mechanisms of learning and remembering seem to depend on relatively enduring changes in the nervous system. Apparently the effects of learning are first retained in the brain by some reversible process, after which a more permanent neural change takes place. Two types of neurological processes have therefore been suggested. The short-term function of memory, temporary and reversible may be achieved through a physiological mechanism (e.g., synaptic electrical or chemical change) that keeps the memory trace alive over a limited period of time. The ensuing, more permanent (long-term) storage may depend on changes in the physical or chemical structure of neurones; synaptic changes seem to be particularly important. Psychomotor habits are mediated primarily by the sensory and motor cortex of the brain and by the neural fibres (commissures) that connect the two cerebral hemispheres. According to the majority of theoreticians, learning proceeds as a mathematical function of the amount or duration of rewarded (reinforced) practice. To acquire and perform such complex skills, a person must closely monitor sensory stimulation. One may need to use visual cues to judge the velocity and trajectory of an approaching object, or monitor the pressure applied by one's own muscles. Hence, the term sensorimotor skill reflects the idea that sensory and motor information must be integrated to accomplish such acts. Motor acts occur automatically, such as blinking the eyes or retracting a finger from a hot surface. Many human motor skills, however, require practice. Such seemingly elementary skills as walking, eating, and dressing must be mastered through practice by every child. That is what we start from the beginning in our form of therapy, to build a developmental line from the basic baby movement to a complex motor-co-ordination movement. Acquiring a motor skill is thought to involve three distinct stages. In the first, called the cognitive stage, the person must comprehend the task requirements. Studies demonstrate that those individuals who were pre-trained with a verbal or illustrative description of the task were more likely to master the skill. During the second or intermediate stage, the individual must apply already acquired motor skills to the new task, master the motor skills unique to that task, and integrate the two to avoid inappropriate and unnecessary movements. In the final stage the skill becomes automat zed, freeing the performer from thinking about each step of the process and minimising dependence on external cues. Fluid execution of motor skills on the part of accomplished performers has led researchers to think that sensorimotor skills are enacted via a motor program, a blueprint for the entire motor act, not just the sequencing of elements. This is well illustrated by the phenomenon of co-articulation. Speech production of the letter "b" in bat is different from the production of the "b" in beat. For such a distinction to occur, the brain must be aware that one "b" is followed by an "a" and that the other is followed by an "ea", suggesting a preconceived plan for the whole utterance. As motor skills are attained, changes in attention to sensory cues and changes in reliance on feedback take place. While beginners rely mostly on external cues, someone who has mastered a skill will rely more on internal sources of feedback, such as those provided by muscles. The kind of formal instruction that aids most in perfecting motor skills varies for the early and later stages of acquisition. During the initial stages, the most essential factors for learning are perceptual awareness, an understanding of spatial relations and comprehension of mechanical principles. Later, motor abilities such as speed of reaction, speed of movement and co-ordination become critical. Retention of motor skills appears to be most dependent upon the degree to which the skill was perfected, rather than upon other variables such as the conditions under which it was learned. If a skill has been over learned, exceeding a particular criterion, retention will be better than if such levels had not been reached initially. We use this form of Psychomotor Therapy in different cases what are connected to the problem of the nervous system. We have different groups and every different group has their own therapist whom educated and well experienced.